Adding a multi-paged status menu and some other menu settings. Open the ORK Framework editor and navigate to Menus > Menu Screens. We already added a Combatant part to our overview menu with some simple status information. Now, we want to create a whole menu screen, consisting of multiple pages displaying more detailed status information (i.e. all Normal type status values, attack attributes and defence attributes). Add a new menu screen and change the following settings. Click on Add Menu Part and than on Combatant. Pressing the Accept input key will display the next page. Now, we already have the first page added, so let’s change the following settings. 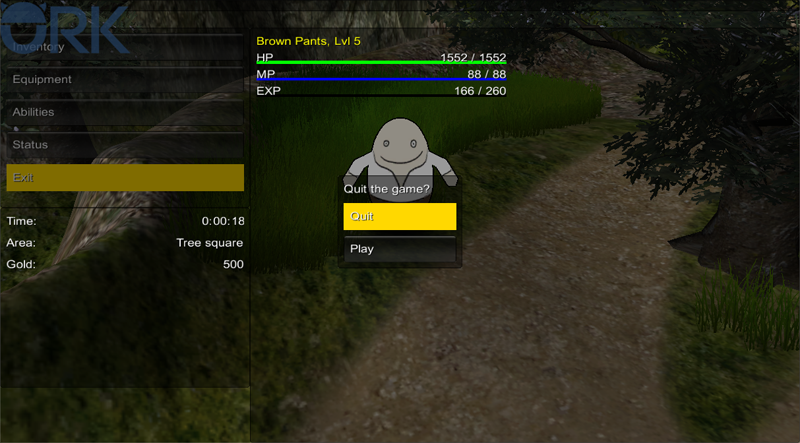 This page will display the status values and status effects of the combatant. Click on Add Status Element to add a HUD element. We’ll use this one to display the name and level of the combatant. Set to %n, Lvl %. Again, click on Add Status Element. Time for our status values. Copy the last element and change the following settings. Finally, the status effects. Click on Add Status Element and change the following settings. Click on Add Content Text to add a text that will be displayed for each status effect. That’s it for this page. This page will display the attack and defence attribute values. Click on Add Status Element to add a HUD element. Again, we’ll use this one to display the name and level of the combatant. Click on Add Status Element. Time for the Element attack attributes. Now it’s time for the Attack Type attack attribute. Click on Add Status Element. Click on Add Status Element. Time for the Race defence attributes. Click on Add Status Element. Time for the Size defence attributes. That’s it for this page, and for this menu screen. Now, all we need to do is to add the last menu screen to the overview menu. Select the Overview screen and change the following settings in the Button List part. Click on Add Menu Item to add a new button to the menu. Set to: Show detailed status information. And finally, we’ll add a button to return to the main menu. Click on Add Menu Item again. Set to: Exit the game to the main menu. When selecting the Exit Game item in our overview menu, the game will display a question dialogue asking if we really want to quit the game – so let’s set it up! Navigate to Menus > Main Menu and change the following settings. Set to Quit the Game?. The question dialogue will be displayed as a choice dialogue. Else, the Ok and Cancel buttons of the GUI box will be used. That’s it for the exit question. There are some general settings that affect all menu screens, let’s take a look at them. First, navigate to Menus > Text Display Settings. Most of the time, Abilities have use costs (like our Small Heal costs 2 MP). How those costs are displayed in menus is defined by the Use Cost Display settings. You can set up a separation string (by default an empty space) and the texts for negative, positive and set changes. Combatant Selections are used whenever you make a combatant choice in a menu screen (e.g. when using an item, or when using the Select Combatant option in the overview menu). The default layout to display a combatant is made here, but can be overridden in a combatant selection. For our small game, we don’t need different combatant selections – so let’s tune the default layout a bit. We’ll use a HUD as a template. Navigate to Menus > Menu Settings. You might have noticed the background image settings in the menu screens. While you can set up a background image for each menu screen individually, it’s more convenient to use a general background for all menus (menu screens can still override them). The Default Backgrounds are displayed with a menu screen, but they’ll fade in and out with the screen – this can lead to flickering. To prevent this, you can use General Backgrounds – they’re displayed as soon as a menu screen is displayed and will stay visible until the last menu screen is closed. The default menu buttons (like Back, Cancel or Unequip) are defined here. As mentioned earlier, the combatant selections are used to display combatant choices in menu screens. You can set up different default combatant selections (e.g. to select the menu user or target of an item or ability). Some of the combatant selections can be overridden by other parts of ORK Framework (like the item target selection can be overridden by items). The actual combatant selections are set up in Menus > Combatant Selections. Quantity Selections are used to select quantities of items, equipment and other things. There are various default quantity selections (like for dropping or buying items). The actual quantity selections are set up in Menus > Quantity Selections. Open the main menu scene (0 Main Menu) and hit play. In the menu, you can now display the detailed status information and change the page by using the Accept key (enter). And you can quit the game and return to the main menu! This concludes the menu screen tutorials. And that’s it for now – the next lesson will cover our first quest.